Several issues can contribute to discoloration or funny taste of your tap water. Most of these causes are related to what is happening on your property or in your city. Thankfully, you can take steps to improve your drinking water, no matter where you live. City water homes can be a little more certain that water problems originate on your property. However, some exceptions exist, like Flint, Michigan, where lead contamination was found in the municipal system. Begin by evaluating your pipes. In addition to noticeable changes in color and taste, changes in water pressure can also be a sign of issues. Corrosion can cause partial blockage within pipes. You can also check the exterior of your pipes, looking for leaks. Note that pipe repairs or replacements are often best left to a professional, unless you are an experienced DIYer. The first step to improving well water is to have it tested to find out if contaminants are present. If the water is clean, then you should investigate other issues such as leaks. If you do unearth a chemical imbalance, there are water treatments that may make a difference. Check the pump and well casing for cracks or leaks. These can lead to seals failing and water becoming contaminated with dirt and sediment. Hiring a professional can ensure you get any fixes made properly. Whether you're on city or well, a water filtration system can remove impurities and improve taste. Depending on what solution you choose, the cost can range from $15 to 20 for a faucet purifier or thousands for a whole-home system. More than 2,000 surveyed homeowners invested an average of $1,700 on their filtering system. 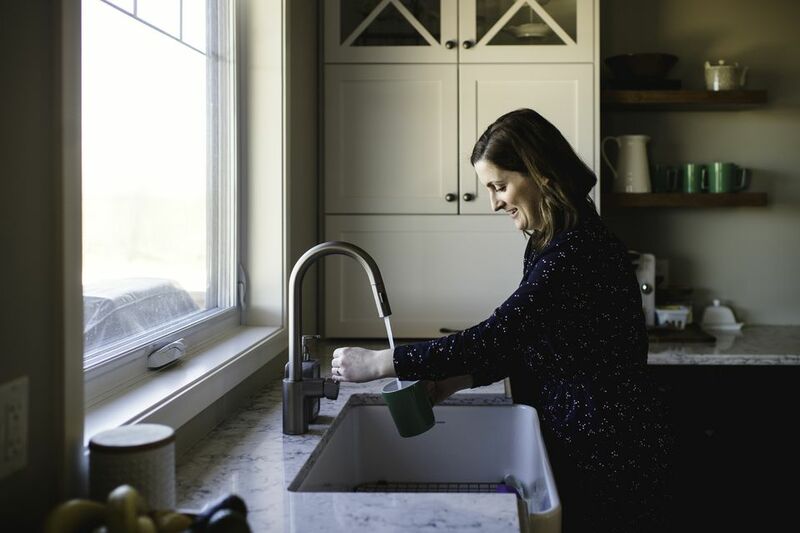 The first step to improving your home’s water quality is to find out which system will work best for your household. This filters all the water you use, including that for showers and laundry. Typically, whole-house purifiers are installed on the main water supply line and may involve both a pre-filter and the main system; in most cases, they should be installed by professional plumbers. If your water is generally fine but sometimes has an objectionable color, odor or taste, then a purifier installed on the cold-water supply line that comes into your sink or refrigerator can help. These are usually smaller and can be done by a homeowner with moderate plumbing knowledge and a pipe cutter and wrench. Some purifiers can be installed directly on the kitchen faucet. Reverse osmosis systems are usually installed at the sink, but faucet models are also available. These work by passing the water through a series of membranes that remove bacteria, sediment and pollutants. Oxygen and some naturally occurring minerals stay behind, allowing for good-tasting drinking water. The complexity of the system makes it best installed by a professional, but you'll need to replace the filters on a regular schedule. These systems remove all the impurities from water, including minerals and oxygen. They heat the water to create steam, then condense it into pure water. Distillers are not as difficult to install and many homeowners will be able to connect them without hiring a professional. If you have any questions or concerns about the quality of your drinking water, it's best to test it immediately and drink only purified, bottled or boiled water until you are certain it is safe to consume. But if your issues are largely cosmetic and are not health hazards, changing your pipes, checking your well and considering a water filtration or purification system may help you get clean, refreshing water.